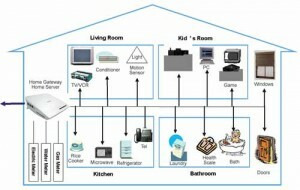 Market research firm Infonetics Research has released its quarterly Home Networking Devices market forecast report, which tracks, ranks, and analyses vendors that make residential gateways, broadband routers, HomePlug Powerline adapters, MoCA coax-Ethernet adapters, and home network attached storage (home NAS). “Sales of home networking devices grew 11 per cent in 2010, to $5.15 billion, on the heels of a forty-six per cent jump the previous year, with all segments of the market posting increases. We are expecting a challenging year for residential gateways this year, though, as operators have a lot of inventory on hand but are having trouble adding new DSL and cable subscribers. This trend will keep the overall market flat in 2011 despite strong sales of Homeplug Powerline adapters, MoCA coax-Ethernet adapters, and home NAS,” predicts Jeff Heynen, directing analyst for broadband access at Infonetics Research. – Quarter-over-quarter, the home network device market was up just 0.1 per cent in 4Q10 as residential gateway and broadband router sales slowed in Asia Pacific and Central and Latin America after a surge the previous quarter. – The small but fast-growing MoCA coax-Ethernet adapter segment posted the highest revenue growth in 2010, up 93 per cent. Pace, which recently acquired 2Wire, now leads the residential gateway market. – The EMEA region leads the world in HomePlug adapter and home NAS device sales, primarily because IPTV penetration is so much higher there, particularly Europe, where telco operators typically offer a HomePlug kit to connect an IP set-top box in the home to a residential gateway. – While relatively small now, the home NAS (network attached storage) market is forecast by Infonetics to more than quadruple between 2010 and 2015 as more consumers purchase these devices to centrally store digital content to share across multiple PCs, tablets, gaming consoles, connected TVs, Blu-ray players, smartphones, and other platforms in the home.